A special filling station is opening in Berkshire to service a new fleet of double decker buses - which run only on fuel made from sugar beet waste. 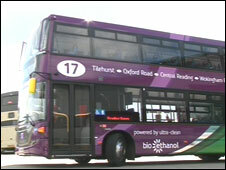 The bio-ethanol vehicles were bought by Reading council, which claims they will slash carbon emissions by 80%. The new filling station at the Reading Buses depot will service 13 buses with the fuel, made from sugar beet husks. The fuel, derived from a renewable source of sugar beet in East Anglia, proved successful during trials. Reading is the first area in the UK to introduce such a large fleet of buses using the low carbon, low emission fuel and £2.8m has been spent on the project. The vehicles will operate on the number 17 service. The use of the environmentally-friendly buses cut emissions in Stockholm, Sweden, by more than 9%, after they were introduced 10 years ago.